This package has now been officially relased on CRAN. Most things should work as expected, and the API should now be relatively stable. For feedback and feature requests, please open issues on github. Ridgeline plots are partially overlapping line plots that create the impression of a mountain range. 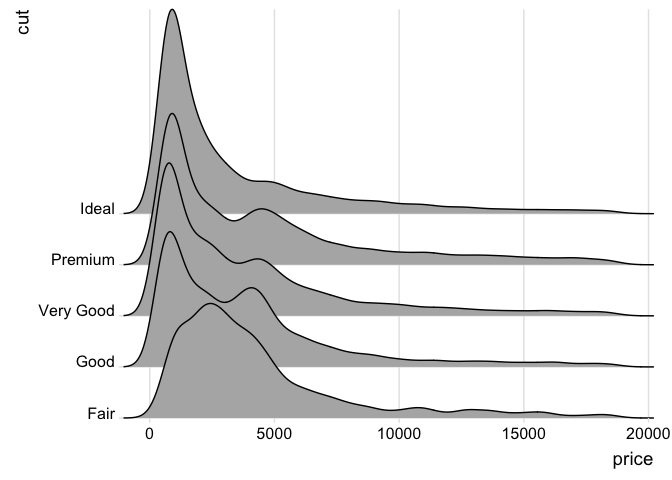 They can be quite useful for visualizing changes in distributions over time or space. These types of plots have also been called “joyplots”, in reference to the iconic cover art for Joy Division’s album Unknown Pleasures. However, given the unfortunate origin of the name Joy Division, the term “joyplot” is now discouraged. First read the package vignette. Then read the reference manual.